Dun Laoghaire-Rathdown County Council was criticised last week for its draft redesign of Monkstown Village which includes no cycle route provisions and makes a two-way street one-way without contra-flow cycling. “If you would like to safely to walk or cycle through Monkstown Village, please email the council to ask that they plan for the future,” said Cllr Ossian Smyth (Green Party). Consultation files and details, and a simple online submission form can be found at dlrcoco.citizenspace.com. The closing date for submission of comments or observations is Wednesday April 27, 2016. “Sadly they have redesigned Monkstown Village with no cycle lanes and with a large proportion of the village centre taken up with a right turning slip lane to increase throughput of cars,” said Cllr Smyth. 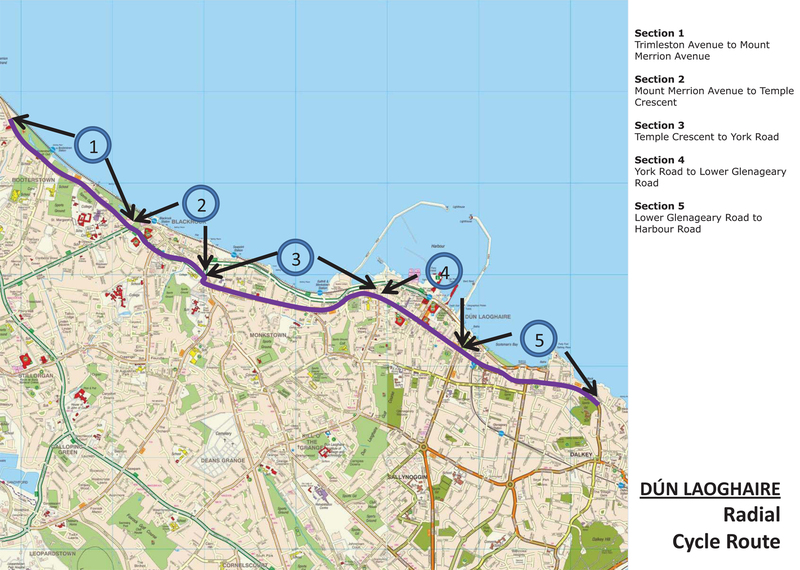 The Monkstown Road is part of one of five of Dun Laoghaire-Rathdown’s primary cycle routes, the Dun Laoghaire Radial Cycle Route which runs between Dun Laoghaire and Dublin city centre, taking in Blackrock and Booterstown. It is disappointing that such a large expenditature of public funds would neglect to cater for the most vulnerable of all road users. Congratulations on the initiative to turn this street into a more people-centric place. Monkstown Road is currently a hostile place for non-motorists, as your scheme report accurately describes. Cars pass through at high speed despite the many shops and houses on either side of the road. The unnecessarily wide road and large junctions create an intimidating space for pedestrians and cyclists. It suffers from the “arrogance of space” typical of cities that have evolved passively around the perceived needs of motorists (http://www.copenhagenize.com/2014/09/the-arrogance-of-space-paris-calgary.html) rather than people. Many of your proposed changes would certainly improve the experience. But there are too many unnecessary concessions to the motorist. The road will remain a passing-through point for motorists, rather than an attractive destination. These objectives are in conflict, so you must either choose to allow fast traffic throughflow or create an attractive destination. You can’t do both. With some small adjustments you would achieve a much better result for all users, including the motorists that want to come to Monkstown. – pedestrian priority: zebra crossings should be included at all junction arms and instead of the two “courtesy” crossings. Under existing law, cars must give way to pedestrians at junctions, yet this is not understood by most people in Ireland. Zebra crossings make this clear. Likewise, the courtesy crossings are meaningless. Cars don’t feel obliged to stop in them and therefore they are worse than useless, because pedestrians don’t even have the benefit of a signal to cross. I’m not suggesting that you put a signalled (Pelican) crossing here. A simple zebra crossing would reprioritise the traffic flow without in any way hindering cars from their journey. Pedestrian crossings must always be on the desire line (where people want to walk); the proposed crossing on the junction on the top left of the picture is set too far back. – Road width: the approach road on the bottom-left of the picture shows an appropriate road width — it’s hard to judge but it seems to be no more than 3m. This is all the space that a car or van needs. But the main road is clearly wider. This is unnecessary and will cause cars to drive faster and make the space more hostile. The lanes in both directions should be the minimum width and no more. This would free up valuable space for other users. – turning lane: this is unnecessary and should be removed, also in favour of space for other road users. – cycle path: a segregated bicycle path should be provided. It’s unacceptable that no provisions whatsoever have been foreseen for cyclists. – car parking: there are far too many car parking spaces. Car parking should be limited to one side of the road only, ideally the non-commercial side. The back-and-forth of people to either side of the road would enhance the calm, people-centric nature of the space. For the sake of ten car parking spaces, you lose a huge amount of space that could be more productively used for people. Including these improvements would be a bold statement of vision for Monkstown village. You would certainly get pushback from businesses and possibly residents for proposing the removal of 10 parking and loading spaces, and if necessary you could acquire an equivalent amount of parking spaces close by on side streets. But you should make the factual argument that more business would arrive on foot, bicycle and public transport by creating a peaceful and vibrant destination full of people and commerce, rather than an incrementally improved busy thoroughfare. tdlegge, that’s a great submission, I’m just disappointed that I’m only reading it now and it’s too late for me to support you aims. Did you get such a well thought out response? Thanks dublinedanto! I didn’t receive a reply other than the pro-forma one but I presume it went into the pile of submissions to be considered (or not) by the planners. I’d be interested to know if responses to public consultations like this one make a difference. Kudos to Cian for flagging it and using this site to generate awareness. Twenty-three people made submissions asking for better cycling facilities in this plan and eight people requested a contra-flow on Clifton Avenue. This is a great response. The roads department has agreed to the contra-flow but are claiming that there is no need for a cycle lane given the speed and volume of traffic (they expect traffic to be below 30kph and volume to be about 5,500 vehicles/day. The scheme will be redesigned and I would be happy to send you a copy of the revised plans. Thanks for making your submissions and thanks to John for emailing me. Hi Ossian, that is good news, but about the “no need for a cycling lane”, I wonder if the people in the roads department would let their young children cycle on the road with cars doing 30 kph. Somehow I doubt it. No matter what, the approach is still car centric and child-unfriendly. I take it that the extravagant provisions for on-street parking are left unmolested? And how about pedestrian safety beyond those oxymoronic “courtesy crossings”? Ossian, would you be willing to post the revised plans somewhere or refer us to a link? It looks like the storage of private property (car parking) continue to be considered more important than the safe flow of people on two wheels like children or elderly and learning cyclists. The staff in the roads department can use as many manuals as they want to justify their decisions, but the golden rule is whether they would let their children cycle among the cars as is being proposed. If it is not good children, then it should go back to the drawing board.